Anyone with a horse prone to poor quality feet will know that managing their feet is a year round job. But weather extremes are even more challenging. The dry, hot summer dries them out causing cracks. And the wet, muddy winter can soften them and lead to abscesses and thrush. Even horses with good feet often struggle over winter. 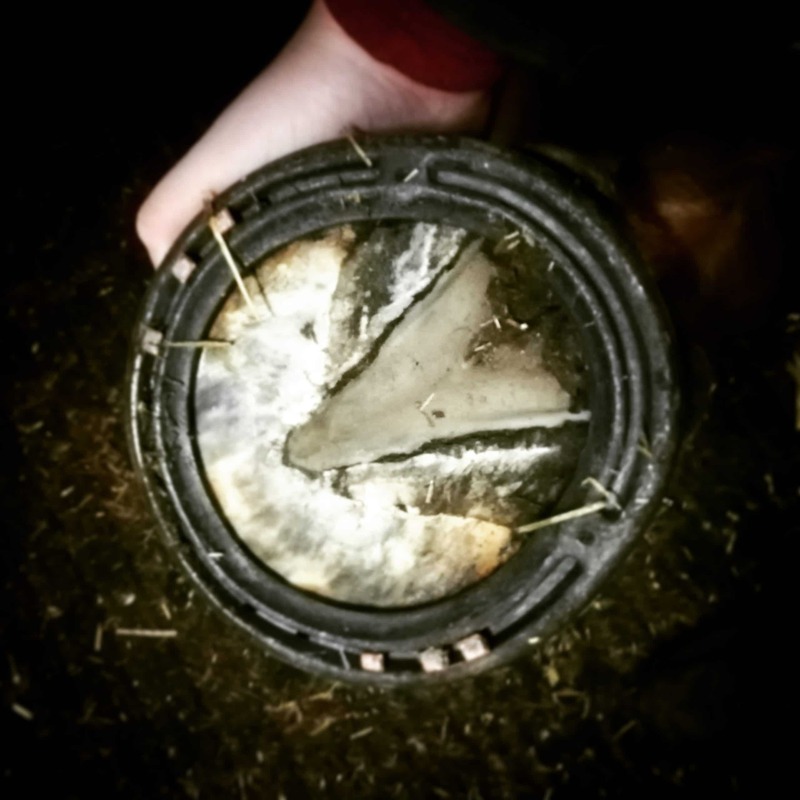 So here are my top tips for managing your horse’s feet over winter. When it’s dry, not much gets stuck in our horses feet. So it’s easy to get into the habit of only picking their feet out when you are going to ride. But over winter it is more important to pick their feet out at least daily. Rossdales suggest twice daily. This is because when it is muddy, this mud tends to stick in the feet, creating a wet and warm environment. This can not only weaken the horn and sole, causing it to crumble, but it also creates the perfect environment for bacteria to grow. These bacteria can then go on to cause issues such as thrush and white line disease. Which can then be tricky to et rid of. Make sure your horse has somewhere dry and clean to stand. For many of us, this will be our horse’s stables. The feet being wet all the time isn’t good! Imagine what living in wet trainers would do to your feet! If your horse lives out, try and create a dry place for them to stand in the field. It could be a rubber matted field shelter. Or if you have a yard on site, try bringing them in and tying them up with a haynet for an hour or so. Anything you can to give them time to dry off. Using iodine is another great way to keep bacteria at bay. You can buy this already diluted or you can dilute it yourself. You can also buy it in spray bottles ready to use. After picking your horse’s feet out, give them a bit of a spray around the frog. I then use the brush on the end of a hoof pick to scrub this into the little dents on either side of the frog. How often you do this is completely up to you. I tend to only use it when Scottie’s feet are a bit smelly, suggesting a build up of bacteria. And even then I would only use it a maximum of once a day. But some people do use it more regularly. Biotin is crucial for hoof health. The average horse needs 15-20 mg a day to maintain hoof quality. So check your horse’s feed to see how much they are getting already. If they are getting around this and have good feet, then all is good! But if they are getting slightly less than this or if they are getting this but their feet aren’t doing so well, you should look at topping this up with a biotin supplement. This is because it takes more biotin (25-30mg a day) to improve hoof health than it does to maintain. Scottie is fed Baileys Low Cal Balancer. This gives him about 15 mg of biotin a day. So I top this up with a biotin supplement. However, since most biotin supplements aim to give you the 30mg to improve hoof growth, I only need to feed half the recommended dose. So a £25 tub lasts me about 6 months! Hardly expensive! Some people recommend cleaning the feet regularly, as hosing the mud off can be good for the hoof. However, if you are going to do this, be careful as this can increase the risk of mud fever. Make sure you get all the mud off and then dry the legs. I like to use stable wraps to help dry the legs. When I was working at a farrier company I discovered copper coated nails. 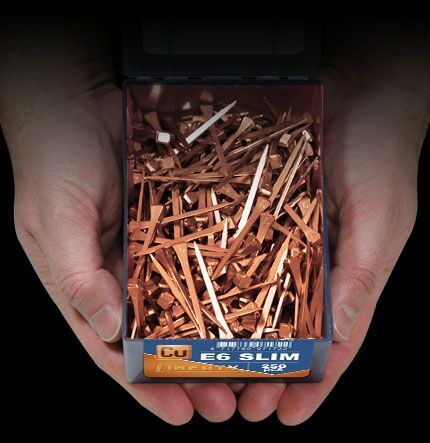 These nails use coppers natural antimicrobial properties to help prevent bacteria getting into the foot during shoeing. Talk to your farrier about trying these on your horse if they don’t use them already. Good tips! I think many forget hooves over the winter, and only concentrating on them in the dry weather but there’s lots to look after over the winter too!